Six people have been killed and three wounded in three locations in Montgomery County, Pennsylvania, officials say. Montgomery County police are seeking the suspected gunman, who they named as 35-year-old Bradley William Stone. They say he may be armed and dangerous, telling residents to remain indoors. The victims are all said to have a familial relationship to Bradley William Stone, who has been described as having red hair and wearing military fatigues. He also reportedly uses a cane or a walking stick. 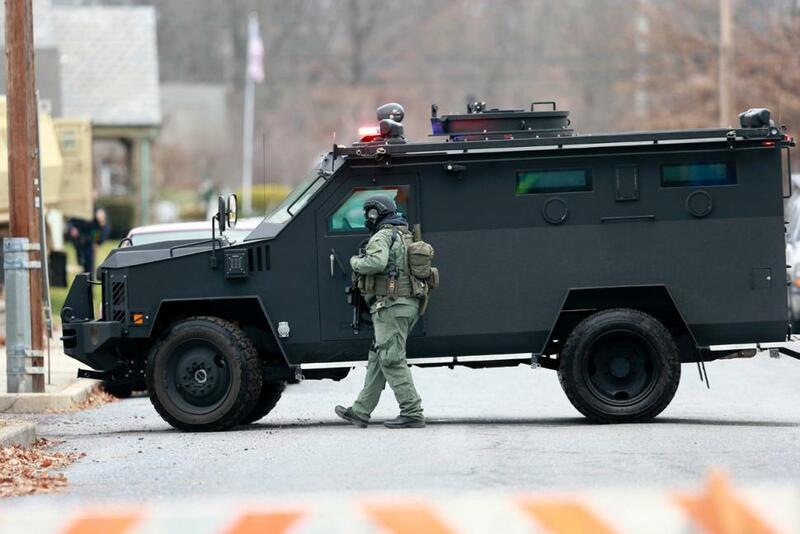 The shootings in Harleysville, Lansdale and Souderton began at about 04:00 local time, according to local media reports. One of the victims is believed to be a woman who was killed in her house. Neighbors said they saw the suspect leave the house with two children, amid reports that the shooting may have been triggered by a custody dispute. The children were reported to have been found safe a short distance away. Police officers later surrounded a home in Pennsburg, where the suspect is a resident. Shelter in place orders were issued for local schools.